Throughout our marriage there have been times when one of us wasn’t able (or let’s face it, sometimes not willing) to step up to the plate, so to speak and do their share. There have been times when one of us had to do way more than our (quote, unquote) fair share. But you know what, that’s okay. Because I know eventually he will need me to step up and do more, or I will need him to do more. That's what a team does. It's not about being divided equally in half. It's about working together as ONE. 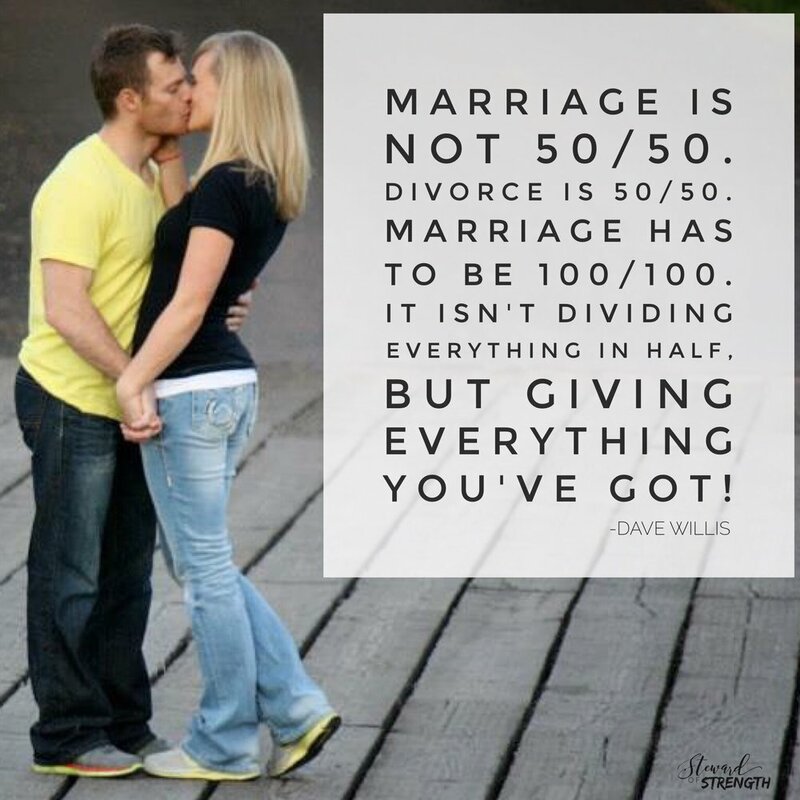 A good marriage, a great marriage - is about giving your ALL, even if the other person can’t. And even if they won’t. • In a 100/100 marriage, you don’t keep score. • In a 100/100 marriage, you give even when giving is hard. Even when you don’t want to give. Even when you feel like you have nothing left to give. • In a 100/100 marriage, you give your all, holding nothing back, even if you don’t get anything in return. Even if you feel like you might be doing more than the other person. • In a 100/100 marriage, you give, because you love, unconditionally. You give them your all. They are NOT based upon on your spouse and what they do and what they don't do. They are based upon the commitment you made to your spouse and to God. A 100/100 marriage is not easy.